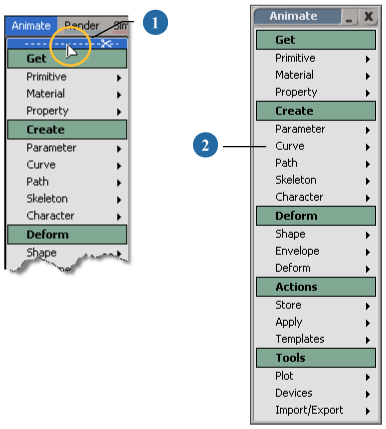 In Softimage, there are many ways in which you can access commands and tools. Many of the tools that are available depend on the context in which you're working (such as the type of object you have selected or the type of view you're working in). This section describes the different ways in which you get commands and tools. You can use the mouse for performing basic operations such as manipulating objects in a scene, choosing commands, and selecting options in dialog boxes and property editors. You must use a three-button mouse on all operating systems. You can access most commands from menus on the main menu bar at the top of the interface, from the toolbars on the left of the interface or from the main menu bar, and from the menus on the main command panel. You can also access commands from context menus by right-clicking or Alt+right-clicking (Ctrl+Alt+right-click on Linux) on various elements. You can keep menus on the main command panel and the viewports open while performing several menu commands at once by holding the Shift key while choosing multiple commands. Middle-click the menu name in any toolbar or the main command panel to repeat the last command you selected from that menu. Some pop-up menus are displayed by Alt+right-clicking (Ctrl+Alt+right-click on Linux) or just right-clicking on individual elements, such as geometric objects, cameras, and lights, in the 3D views, the explorer, and the schematic view, or from specific areas of the interface. These type of pop-up menus are called context menus because they provide commands that are applicable (in context) to the chosen object. Access keys — The underlined letters you see in many menu names. Pressing Alt+(underlined letter) activates its associated command. Shortcut keys — Commands that have been mapped to your keyboard. For example, pressing Ctrl+(key) activates an associated command. Access keys are indicated by underlined letters. Shortcut keys are listed at the end of the menu item. Note that not every menu command has a shortcut or access key. Press Alt+(underlined letter). This works only with the main menu. Press the key corresponding to an underlined letter to choose a menu item or open a submenu. NoteIf you're using Softimage on Windows, the underlined letters in the menus and menu commands are not displayed by default. To display them, open Control Panel > Display > Effects (Windows 2000) or Control Panel Display Appearance Effects (Windows XP). Deselect the option called Hide keyboard navigation indicators until I use the Alt key. To use a shortcut key, simply press the key or key combination. In this guide, the shortcut keys mentioned are always the default ones. You can create your own keyboard shortcuts as described in Key Maps [Customization]. You can also reset the key settings to their default values. The actual shortcut keys (default or not) are listed to the right of many menu command names. As opposed to commands like Duplicate that have an immediate effect, tools are modes in which you interact with elements in the 3D views. For example, you can use the Transform tool to move objects around in 3D space. Shortcut keys are mapped to most of the tools used in Softimage, and pressing a key activates a specific tool. Once the key is pressed, the mouse pointer changes shape to identify the active tool. Any further actions you perform with the mouse are then related to that tool. For example, pressing the Z key activates the pan and zoom tool so that holding down the right mouse button zooms out of the scene, and holding down the middle mouse button zooms in. You can move back and forth between different tools quickly by using these shortcut keys. Only one tool can be active at a time. Sticky — you do not need to hold the key down to activate the tool. Supra (temporary) — you must keep the key held down for the tool to remain active. You can activate a tool in this mode by quickly pressing and releasing its shortcut key. Once the tool is active, you can click and drag the mouse to use the tool. The tool remains active until you choose another tool. To deactivate the tool, simply activate a different one, or press Esc to activate the default tool. If Enable Sticky Key Toggle is active in your Interaction Preferences [Preference Reference], you can also press the tool's key a second time to activate the default tool. Note that if you press and hold the key for too long, it does not get activated because Softimage assumes that you meant to activate the tool in supra mode and changed your mind. You can activate a tool in supra, or temporary, mode by holding down its key while manipulating the mouse. When activated in this way, the tool temporarily overrides the current tool. As soon as you release the key, the previous tool is re-activated. For example, you can press and release the T key to activate the Select Point tool in sticky mode. Select some points, then press and hold the O key while dragging the mouse to orbit the camera around the object in supra mode. As soon as you release the O key, Select Point is active again and you can select points on the other side of the object. Follow these steps for an example of how to activate and work with the commonly used interaction tools such as selection, transformation (scale, rotate, and translate), and camera manipulation (pan and zoom, orbit, dolly). This example assumes you are using the Softimage interaction model. Start Softimage and load a scene. By default, the Select icon (the large arrow button on the Select panel) is on and highlighted in green, indicating that you are now in selection mode. If the Select icon is not on, press the space bar to switch it on. Object-selection mode maps your left-, middle-, and right-mouse buttons to node, branch, and tree selection, respectively. If you select an object that is part of a hierarchy, left-clicking selects only the object, middle-clicking selects all objects in its branch, and right-clicking selects the entire tree (in the 3D views only). NoteYou can select objects in the explorer at any time, regardless of the active tool. Select an object in a User view by clicking on it. After you have selected the object, you can manipulate it, for example, by using a transformation tool such as scaling. Click the Local manipulation mode button in the Transform panel. Press the X key and use the mouse to click and drag the manipulator that appears. The s button in the Select panel is highlighted and the pointer changes to indicate that you are using the scale tool. When you release the X key, the scale tool is deactivated and you return to the previous tool (in this case, the selection tool). For more information on selection and manipulation modes, see Selecting [Scene Elements] and Transformations [Working in 3D Space]. To get a different view of your work, you can change the camera viewpoint. In a User view, press the O key while dragging with the left mouse button to orbit your scene. Quickly press and release the Z key. This activates the zoom and pan tool in sticky mode. Left-click and drag to pan your scene, hold down the middle mouse button to zoom in, and hold down the right mouse button to zoom out. Notice that when you release the mouse button you are still in zoom and pan mode. This is because the tool was activated as sticky: if you quickly press and release the key, the tool is activated and remains that way until you select another tool. To deactivate the zoom and pan tool, press Esc. For information on camera-manipulation tools, see Navigating in 3D Views [Viewing and Playback]. The left mouse button lets you pan (track). The middle mouse button lets you dolly. The right mouse button lets you orbit. To activate another tool, press any key or choose a tool from the main command panel. For example, you can switch to selection mode by pressing the space bar or by clicking the selection button on the main command panel. To reactivate the last auxiliary tool, press, (comma). This reactivates the last tool used in sticky mode other than Select, Translate, Rotate, Scale, or Navigate. You can activate a number of tools from the main command panel. If the Select icon (large arrow) is highlighted, for example, you know that your mouse is mapped to the selection tool. If one of the SRT buttons is selected, you are in transformation mode, and so on. In most cases, the mouse pointer changes to indicate the active tool. For example, when the orbit tool is active, the pointer turns into an orbit icon. The mouse line at the bottom of the interface displays which operation is mapped to each of the mouse buttons. Always check the mouse line for the current tool status. You can repeat the last command in general, as well as repeat the last command from a specific menu button. For example, this lets you apply an operation to the selected object, then select a different object and apply the same operation again without digging through menus and submenus. Choose Edit Repeat (command name) from the top menu bar. Alternatively, press the period key (.). The name of the menu item indicates which command will be repeated. Selection commands. This allows you to apply a command to selected elements, then select other elements and repeat the command. Interactive manipulation, for example, using the transform tools (V, C, X) or the Move Point tool (M). However, transformation values entered numerically in the Transform panel can be repeated. General commands, such as Tools Devices Disable All Devices on the Animate toolbar. Viewing commands, such as toggling the display of nulls in a 3D view. Playback and timeline commands, such as changing frames. Camera navigation and viewing commands, such as orbiting, zooming, and framing. Parameter changes made in a property editor. When the last command can't be repeated, Edit Repeat will repeat the previous command instead. Middle-click on a menu button in a toolbar or panel, or on a sub-menu in a tear-off. For example, select a grid and choose Modify Deform Randomize on the Model toolbar. Then, get a new grid using the Get Primitive menu, and middle-click on the Modify Deform menu button. A Randomize deformation is applied to the new grid, even though the last command overall was from the Get Primitive menu. Note that middle-clicking to repeat a command does not work in the main menu. In addition, it does not work across toolbars — if you choose Get Primitive Null in the Model toolbar and then switch to the Animate toolbar, the Get Primitive menu button in the Animate toolbar does not remember the Null command. You can tear off most menus in Softimage so that they stay in floating windows that you can move around the interface as you like. This is useful for when you have a few menus that you use sometimes, but don't want to always have to change toolbars or menus to access them. Or you want to hide the main command panel, for example, to gain viewing real estate, but still want to keep a menu from that panel available. A toolbar on the left of the interface or on the main menu bar. The Model, Animation, Render, Simulate, and Hair toolbar names on the main menu bar. This creates a floating toolbar. The Animation menu at the bottom of the interface. 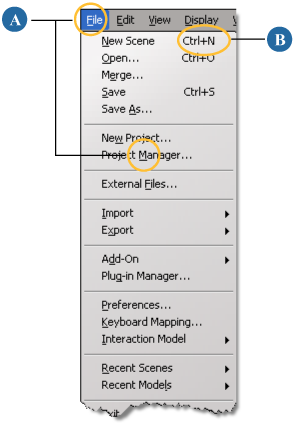 Click on the dotted line at the top of a menu or submenu and drag to any area in the Softimage interface. When you release the mouse button, the menu is loaded into a floating window that you can minimize, resize, and close. The torn-off menu stays available only for the current Softimage session; that is, it's not saved with your scene. Click on the dotted line at the top of a menu and drag to any area in the interface. The menu is loaded into a floating window for the current session.